In the wildly popular and enigmatic TV show "Lost," strangers found themselves marooned together on a mysterious island where they explored themes of love, death and redemption (and also the nature of time and mortality). 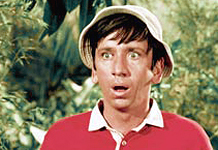 Today’' viewers might have missed the fact that an earlier program, watched by millions of Boomers, also had a reportedly spiritual message — "Gilligan's Island." The seven castaways, who signed up for a "three-hour tour," washed up on an "uncharted desert isle," from which they could never escape. In this telling, no time travel tricks were allowed. And each of them, according to a book by the show's creator, Sherwood Schwartz, represented one of Christianity's "seven deadly sins." So which figure represented which sin? There's even a Bible study book titled Gilligan’s Island and the Seven Deadly Sins by Stephen Skelton. A separate site sees Lovey Howell as representing sloth, noting that the rich man's wife "has never lifted a finger in her life," and the Skipper represents both gluttony and anger. "Gilligan is the person who put them there. He prevents them from leaving by foiling all of their escape plots. Also, it is his island," the site notes, "[and] he does wear red in every episode." Could the goofy title character in the white sailor's hat be, well, Satan? I wish I had access to this when I preached on the Seven during Lent! So I wonder if there were covert messages being communicated when the Harlem Globetrotters or the Soviet astronaut or the head hunters dropped by. PastorMack, my thoughts too! I thought I might be the only UM pastor preaching on the seven sins for Lent this year - interesting to know somebody else was using the same idea as a framework. I hope it was a positive experience for you and your congregation - I received positive feedback here.